The wig was styled and cut. It originally was a shoulder length bob with with a side part and no bangs. I'm happy on how the bangs turned out and the rest of the cut. Vest was made using my school girl Ririka vest as a guide and then just making it up from there. Vest is lined and the white straps are elastic for the halter part. The most time consuming and fun part of this costume was making the parfait. I couldn't cosplay Kyoko without it since it's pretty much all she ever does is eat them. The glass is a large vase. I painted on the inside with black acrylic paint for the chocolate sauce. All the inside is sand. The top was made with a small circle wood piece that fit snug onto the top of the vase. From there I made the ice cream, strawberries and cherries out of sculpy light. It was my first time working with this product and now I love it! !Painted all the strawberries and ice cream with acrylic paint. Used hot glue for the texture of thick chocolate sauce on top of the ice cream and then painted over the glue with black puff paint. Got a thin wooden dowel. Painted it with the black puff paint. Once it dried I painted it with brown paint to make a stick of pocky. Glued everything together. Lastly adding the whipple for the whipped cream. Overall I think the parfait took me like 25 hours to make, but it was worth it! This costume was on the to make list since the beginning of the year. I'm glad I finally got to wear it. ^__^ I think I was most excited to wear this costume because I don't normally cosplay characters like Kyoko. Yay for an age appropriate character for me!! 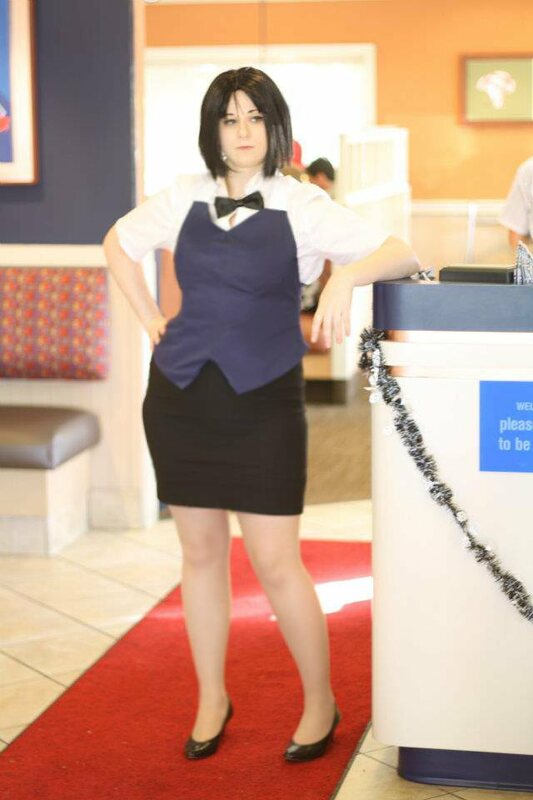 This character is different from all the others I cosplay because she doesn't show much emotion except when you piss her off. There is something about a manager that does pretty much nothing but eat parfaits that got me to love this show. It's fun to watch this anime about working in a restaurant and all the drama between the coworkers! I'm quite excited about watching the second season that is coming out now.